I’ve talked about facial wipes on the blog a few times. I really only mention them if they really wow me. 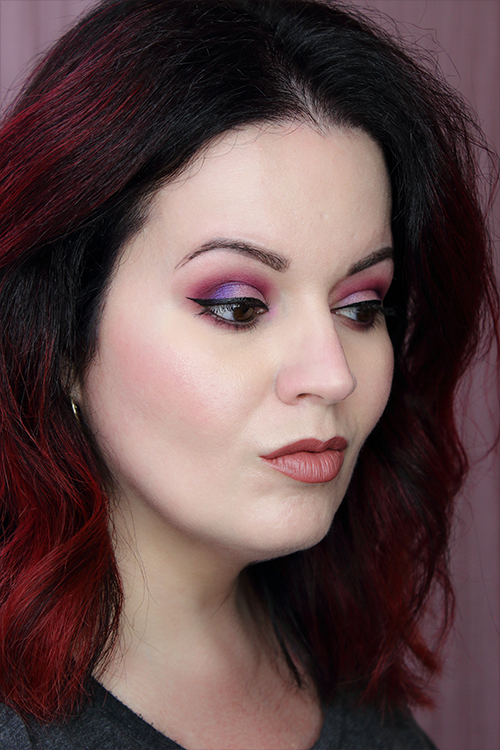 I keep a bunch on hand to remove swatches and lipstick, but I rarely use them on my face. I hate the way most wipes leave my skin afterward. Ever since being diagnosed with rosacea I’ve had to lay off my favorite wipes until my skin is healed. I’m not supposed to exfoliate right now. I’d hate to waste one of those wipes only using one side. So I had to find a more gentle wipe to use in the meantime. Then I remembered I had this lovely package sitting in my drawer. 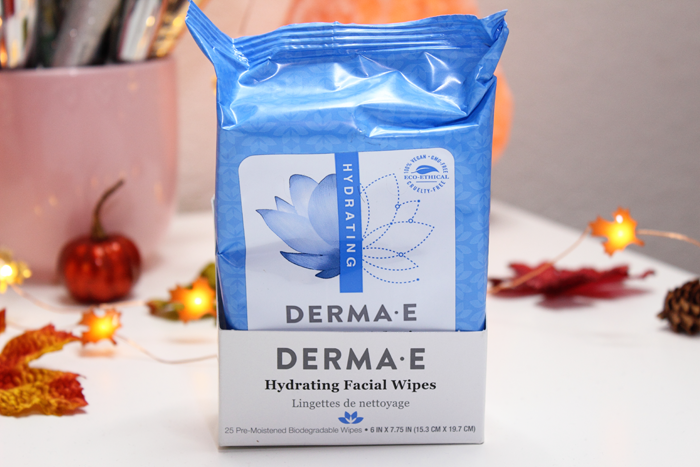 I’ve been using the Derma E Hydrating Facial Wipes for the past month to remove my eye makeup and lipstick. And you know what? I’m in love! The package contains 25 wipes. They claim to quickly and conveniently remove makeup, oil, and impurities while hydrating, softening, and smoothing the skin. They are infused with hyaluronic acid and superfruit extracts. Each wipe is 100% compostable and the outer packaging is 100% recyclable. So why do I love them so much? Like I mentioned before, they don’t leave an icky film behind after using them. I don’t feel the need to quickly wash my face after removing my eye makeup. Even though I should because I seriously look ridiculous. But when I’m home I’m usually bouncing around from room to room doing at least 10 different things at once. It’s a relief to not have to worry about my skin feeling gross or my eyes stinging/burning because all I wanted to do was remove my eye makeup. They’re also super gentle for the eye and mouth area. I don’t have to rub too hard. My makeup comes off so easily. And they smell so fresh and clean! I detect a light cucumber scent. No strong chemical scent. I really hope Derma E keeps these wipes around. They’re one of the very few I can honestly say that I love. 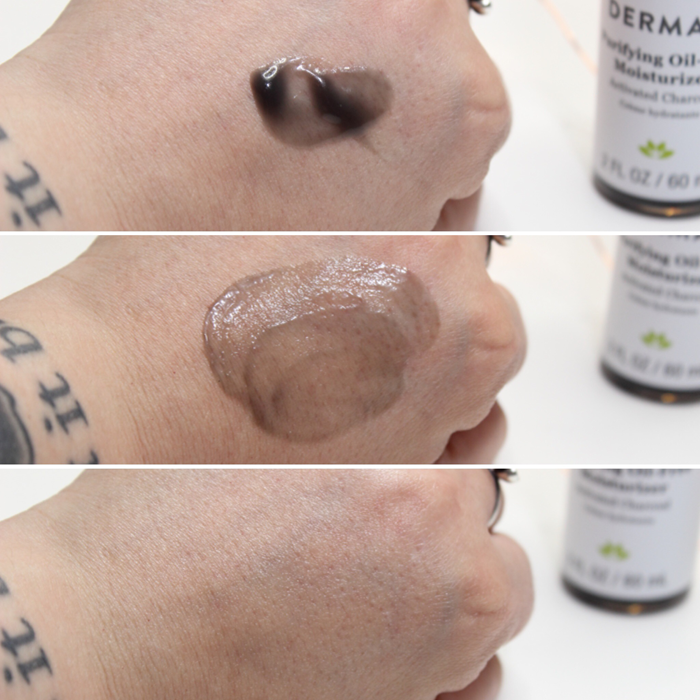 It’s also a huge plus that Derma E is much easier to get my hands on. I’ve spotted their products in quite a few stores. I don’t recall if I’ve ever seen the wipes though. I’ll have to keep an eye out for sure. In the meantime I definitely plan to purchase a few of these online so that I have enough on hand. Are you a fan of facial wipes? Which ones are your favorite? Note: You can also find these wipes on the Shop Hush app. They are $7.00 there and ship for free! I received this moisturizer well over a year ago. I couldn’t wait to try it because it looked and sounded cool. Have you ever seen a black moisturizer before? I haven’t! I tried it a few times and ended up packing it up before our move. When I unpacked it I placed it in my drawer with the other moisturizers. I had forgotten all about it. Until I was running low on my go-to moisturizer and had to use a backup until I got it replaced. That’s when I rediscovered this gem. 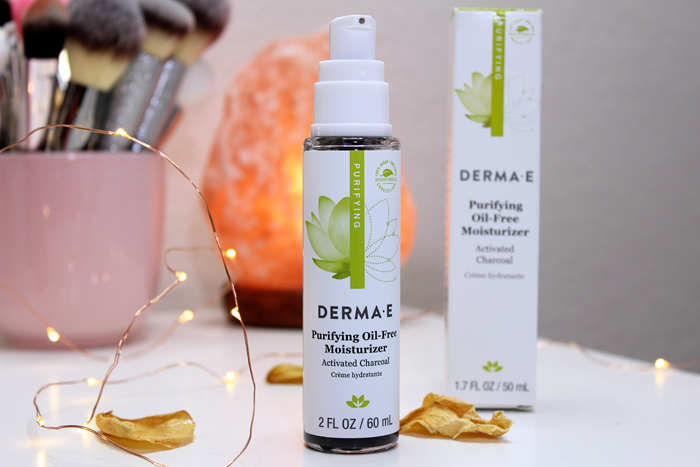 The Derma E Purifying Oil-Free Moisturizer is described as a silky, lightweight formula that rehydrates, replenishes, and detoxifies as it helps to shield your skin from every day impurities. It contains lots of minerals and natural toxin fighters such as Bladderwrack, Activated Charcoal, Green Tea, and Aloe Leaf. It’s free of parabens, sulfates, gluten, gmos, and oils. It’s also vegan and cruelty free. I’ve got quite a few favorites from Derma E. I’ve tried quite a few moisturizers. Some I liked and others I really didn’t care for. I didn’t exactly have a favorite in that category. Until I started using the Purifying Oil-Free Moisturizer on a regular basis. This is easily one of my top 5 products from the brand now. Here’s why. It does pump out black. It has a gel-like texture. When you start to rub it in it starts by moving around and you can actually see a bit of the black spreading all over. Once it’s fully rubbed in the black is no longer visible. My skin is left feeling a little tacky afterward, but after a while it feels so soft and looks bright and hydrated. It works beautifully under makeup. But what really sold me on this moisturizer is how it helped to soothe my sometimes red and irritated skin. If you have super sensitive skin like I do, I highly suggest trying this out. It might seem a little odd at first, but once you get used to it you will see how great it is. It has done wonders for my skin. Being a beauty product lover and having sensitive skin is tricky. You want to try all of the products, but you never know what’s going to set your skin off. So any time I find a product that actually helps to soothe my irritated skin I feel like I’ve hit the lottery. And I did the moment I rediscovered the Derma E Purifying Oil-Free Moisturizer. Have you tried the Derma E Purifying Oil-Free Moisturizer? What moisturizer are you loving at the moment?